All sighting and photographic references on this page are documented and can be verified through various publications. The day after Mr Cockrell's sighting the monster was seen by a Mr Brown and his wife from Invergordon in the same place but closer to shore. They described it as three thick black humps moving through the water with 50 ft ahead of the humps a movement which seemed to suggest a head. A member of the Northern Naturalists Organisations, Mr Peter O'Connor from Gateshead, Durham had a sighting. From the garden of the Foyers Hotel he and a number of other people saw the creature at around 4 o'clock in the afternoon. At first he thought it was a rowing boat about 200 yards from the Foyers shore but using his field glasses he could see a brown coloured object which was slowly sinking. Mr O'Connor encountered the monster yet again 3 days later. Between 6 and 6:30 a.m. he went for a walk along the shore beside Foyers Bay and the monster glided into view around the headland. He waded into the water up to his waist to get a closer view. It features were small and sheep-like and a very, very strong neck. It's skin appeared smooth, very like a seal. He turned to yell to his companion and then turned back and took this photograph, to the right, as it disappeared into the turbulence it had created. This date is generally regarded to be the first major scientifically planned expedition of its kind to visit the Loch was conducted by The Universities (Oxford and Cambridge) Expedition. The purpose being to make a general study of Loch Ness, paying particular attention to the possible existence of the Loch Ness Monster. Participant in the expedition numbered 30 volunteer graduates and under graduates who used cameras and an echo sounder mounted on a boat. They did encounter one visual sighting of what appeared to be the monsters back moving through the water. Another sighting they had was of an object that continuously changed shape on the surface of the water. Numerous echo soundings were taken which were of unusual character. A sighting was reported on this date by a witness who wished to remain anonymous. The witness was driving south-westerly along the main road towards Abriachan pier when he noticed a small yacht travelling up the Loch. He then realised there were two V wakes parallel to one another. The closest of the two wakes came from the yacht and the second appeared to be caused by something just under the water. The object surfaced and looked just like a midget submarine without its periscope. The colour was greenish black, about the size of the yacht, which was in fact 48ft by 10 ft. In 1973 an interesting sighting was reported by a Mr Jenkyns of Pointclair, Invermoriston. Mr Jenkyns had a head/neck sighting in a close range observation. The sighting report is as follows : Mr Jenkyns lived in a house which is 12 yards above the surface level of Loch Ness. On Saturday 10th November 1973, at about 11:45am he tried to start a tractor which had been stuck for some weeks on a piece of rough ground sloping down to the loch edge to partially built jetty it was a cold slightly damp day, with a strong south-westerly wind on the surface giving a heavy swell with waves over 2ft high. Mr Jenkyns used an engine chemical to start the tractor and as the tractor did not have a silencer there was an explosive noise, so loud that Mrs Jenkyns heard it in the house, despite all the windows being double glazed. Immediately after the noise of the starter, Mr Jenkyns heard a very loud splash, which he described as an impact splash as if something very heavy had been thrown into the water. It was a single noise and was not followed by any further splashing. Being under the impression someone must of thrown a heavy object into the water, he got down from the tractor, walked round it and a good look along the shoreline. He then went back to the tractor and 2 mins after hearing the splash noticed in the water 5 yards of the end of the jetty a ring of concentric circles, showing despite the waves. While he was looking, a little to his left an animal emerged quietly and smoothly (the distance from the observer being about 45 yards) in a north-easterly direction parallel to the shore, then submerged straight down. Throughout, the object maintained a rigid pole-like posture and its motion through the water was very smooth, with no apparent sign of any jerky movement. The head and neck were slate-black, quite rigid and about 9 inches in diameter. He observed a slit mouth, what appeared to be some large scales on the top of the head but not the neck, and above the mouth an eye or possibly a vent. The eye was quite tiny in proportion to the mouth. When the object rose out of the water, it formed an angle 80 degrees to the water, but when it started to move and throughout the movement it formed a 60 degree angle. There was no sign of any fins, horns or other appurtenances. The water at this point is estimated to be only 10 - 20ft deep. I was driving from the camp site where I was staying at Invermoriston, north to Inverness on the main road when a few miles after Urquhart Bay, passing a layby with a good Loch view, I saw 'It'. 'It' was at a distance of some 200-300 metres, shaped like an upside-down (black) rowing boat, speeding away from the shore. The speed was remarkable because of the wave 'it' produced. Other people must have seen 'it', a sailing boat crew might have spotted something as 'it' was coming their way. A touring bus was in front of me and crossed the road to pull into the layby. Passengers in the rear of the bus were pointing at the Loch also. Everything happened in seconds. The time of this sighting was between 10 and 11 a.m.. The sky was cloudy but the Loch could be clearly seen and the wind was very low. Back in Holland the story of my sighting was not believed so I have kept quiet about until now. Edna MacInnes and her boyfriend, David Mackay said they watched the creature for 10 minutes. Miss MacInnes said that the 40ft beast waved around its giraffe like neck then vanished into the water. Later on the same day James Mackintosh and his son also spotted a brown thing with a neck like a giraffe break the surface. Mr Mackintosh remembers: "It was an eerie experience, it was swimming quite swiftly away from the shore." A Lancashire man, named Bill Kinder, observed a black, shiny object rise out of the water and leave a 10 metre wake. This took place on this date 1996 around 10:00am, just north of Fort Augustus. Also on the same day, the Ling family from London who were travelling behind Bill Kinder on the west shore, reported seeing two humps rise out of the water and leave a long trail. Two large brown shapes were spotted by a couple from the Black Isle, which appeared to be 10 feet in diameter and 3 feet apart. The object was 200m from the shore near Urquhart Castle, it then travelled across the Loch and disappeared. A representative of Union Commercials, named Jonathan Murphy, on his first visit to Loch Ness to make a television commercial for Vodaphone, contacted a local paper and said he saw something in the water. He had photographed the object which was then sent to NASA for a thorough investigation. 13th June, 1996Staff and guests of the Craigdarroch House Hotel, Foyers, witnessed at 8:30pm, a bubbly disturbance which was followed by a wake, it then travelled zigzag across the water, creating movement on the Loch for around 10 minutes. During their visit to the Loch Ness Caravan and Camping Park at Invermoriston, Emilio Demnio and Nikhi Banjeri from Preston, reported seeing a dark brown or black hump appear in the middle of the Loch and stayed for around 10 minutes, at 2:15pm. While on the pier at Fort Augustus, three witnesses including holidaymaker Nick Watson saw at around 5:30pm a black hump approximately a mile from the shore. It was creating a large commotion on the surface. A few minutes later it headed away from them and disappeared. A camper at Invermoriston photographed what looked like a head and a neck emerging from the Loch. Glaswegian Craig Kerr reported it to a national newspaper. The object appears in the background of a photograph he was taking of another subject. He did not realise this until the film had been processed. Staff members at the Clansman Hotel beside Loch Ness, during their lunchbreak around noon witnessed several humps appear in the Loch. They appeared to be black and were around 1 metre long. They disappeared and shot to the surface again further out in the Loch within moments. As someone with scientific education (physics) I will not believe in anything I don't know for sure. But I was on Loch Ness for four days in 1996 during the first days of September with four relatives, we saw something we could not quite explain: We had rented a motor cruiser to travel on the Caledonian Canal for two weeks. We spent one night at the Foyers pier. The weather had been fine in the evening, and the loch was very quiet in the morning, practically no waves at all, clear weather. Around 8:45am, I noticed something like the trunk of a large tree, floating motionless just under the surface, about 100 meters in the direction of Urquhart Castle. My four fellow boaters saw it, too, after I asked them what it was. It did not move for at least 15 minutes (well, one of us thought it had moved slightly). We speculated what it could be, we watched it with binoculars (which revealed that it was not a single blob of darkness, but had limblike substructures, as if it really was a dead tree), but nobody took a single photo! I still can't believe it... Finally we took off to visit Urquhart Castle. I took a course that would take us close to the point the mysterious object was floating. Due to the position of the steering wheel, I could not see it during the beginning of the approach and relied on the others to take a close look. But when we got there, nothing was visible. Not only that, but nobody had actually seen it disappear. One moment it had been there, a moment later it was gone without a trace. It was obviously no tree. Was it one of the almost stationary zones of rippled water that can occur on lakes due to wind and current? It was so isolated - one dark spot in a wide totally quiet surrounding - and stayed unchanged for 15 minutes or more, and it was darker than the normal shadow - to me that explanation seems practically impossible. The same reasons exclude a cloud shadow. For a mirage it was not far enough, and one thing I am absolutely sure of: It was under the surface. The only thing I can think of as possible explanation is a thin floating layer of dark particles, slowly collected overnight by the currents of the Foyers bay and of the open loch, clearly visible only because of the flat viewing angle. But then, why didn't it disappear gradually when we approached the spot? A family reported seeing an object travelling quickly through the water. A local man from Glenurquhart filed a report about seeing two humps in the water near to Abriachan. A South African holidaymaker reported to have seen two humps appear from the water near Aldourie Castle beside Loch Ness. A visitor from the Isle of Skye reported seeing something odd in the water near Foyers. An object which looked like a pole appeared from the water near Dores, the top of which looked like a small head that looked around and then disappeared. About 1 mile south of Urquhart Castle, at around 9:00am, a dark object was spotted moving swiftly across the Loch. Another sighting was reported by the producer and technician of an American film team who were filming a documentary at Strone Point, above the castle. They spotted a dark object moving swiftly across the Loch about 1 mile south of Urquhart Castle around 9:00am. Unfortunately it had disappeared before the cameraman had time to record it on film. The "Royal Scot" from Fort Augustus reported two sonar contacts at a depth of 400 ft in a trench just north of Fort Augustus. The "Royal Scot" again reported a similar contact at a depth of 300 ft. There was a report of a camper, who was staying at the Loch Ness Caravan and Camping Park at Invermoriston, which told of her experience during an incident at around 3:00am. She had heard something splashing about in the water and realised some ducks nearby were becoming restless for some reason. Then she said she heard a strange buzzing noise from the Loch but it didn't sound like a boat or other engine. A report of a large, dark, coloured object appearing in the water near Abriachan and moving at speed. The first reported sighting of the the Loch Ness Monster in 1998 was made by a 22 year old female tourist from Marlborough, Wiltshire at 8:55am. She saw a large black object rising about 10 feet out of the water just beneath Urquhart Castle and claimed she had been able to see the object for a full 2 minutes before it disappeared. Around 5 a.m. a group of young men on a hill walk claimed to have witnessed Nessie as they were descending a hill near Inverfarigaig. The men, brothers Adam and Mark Sutherland and Peter Gillies from Inverfarigaig and Peter Rhind from the Black Isle watched the shape for about 45 minutes through binoculars before it disappeared under the water. They described the shape as being about 300 metres from the shore, massive in size with a long tail. The Loch was flat calm at the time. At approx 11 a.m. Melissa Bavister and Chris Rivett, a couple on holiday in Scotland from Northampton. were travelling on the North shore of Loch Ness near Drumnadrochit when they stopped in a lay-by to take a scenic picture of the Loch using a camera with a 23mm lens. They hadn't noticed that also in the pitcure was the now familiar humps that are associated with Nessie. When they returned home and had the film processed Chris noticed the humped shapes in one of the photographs. They were just passed the village of Lochend. "It was a fine clear day and we are positive there were no craft on the loch or birds flying about." said Chris. Experts have agreed the single photograph showed a very large object in the water half a mile from either shore. The exact location, near the reputedly haunted Boleskin House, is one of the deepest parts of the 23-mile-long loch, believed to be around 700ft deep. Approx 6 a.m James Gray and Peter Levings were fishing on Loch Ness near Invermoriston, about three quarters of a mile from where the River joins the Loch. Mr Gray said the conditions were absolutely peaceful in the middle of the loch. He then spotted a movement 150 yards away and saw something sticking out of the water. He grabbed his camera and took a few snaps. The object then raised up a couple of feet and was rising as he looked at it. He said: "Soon, it was about 6ft out of the water but secods later it had become a black kind of blob as it disappeared. It had curled forward and gone down." He added: "This was certainly no seal. It had a long black neck almost like a conger eel, but I couldn't see a head. It didn't seem to bend very much but as it went under it sort of arched and disappeared. "We circled for twenty minutes but found nothing." This proved a good day for monster spotting with no less than three sightings in eight hours. Two of the sightings were from the cruise boat Royal Scot and the third was claimed by a fisherman at around 10pm. All were reported in the Fort Augustus area. The skipper of the Royal Scot spotted a fast moving wake in the water at around 2pm, but thinks he was the only person aboard to see it at the time. "The loch situation at that time was flat calm - absolutely mirror glass," he recalled. "It was travelling at 30 to 35 miles per hour. It was probably chasing salmon. It seems to be some sort of fish eating machine." The second sighting at 8pm lasted for 35 minutes and was witnessed by all 25 passengers and three crew aboard at the time. "What we saw was the top of a hump four or five feet long and five or six inches out of the water," the skipper revealed. The sightings came a week after the boat's sonar detected an object 20 feet long and weighing almost two tons, 320 feet below the surface in the same area. The third sighting was reported at Borlum Bay. 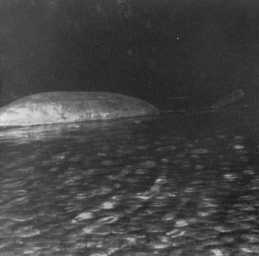 A fisherman saw something resting on the surface for three or four minutes before it did a surface roll underwater and disappeared. It was described as almost black in colour and close to a seal in size. Tom Clegg of Worcestershire saw what he is certain was the monster just before 4pm. Tom saw the creature in the south of Loch Ness between Invermoriston and Fort Augustus. "I saw three dark humps in the water," he recalled. "It was maybe about 150 metres out into the loch. The humps were three to five metres in length maybe. The skin seemed very smooth. It didn't look like anything I'd seen before." He watched the humps for three to five seconds before they appeared to slip below the water. Tom remains convinced he saw an animal of some kind and rejected the suggestion he may have been fooled by a boat wake. "That was the first thing I checked for, but there wasn't a wake. There weren't any boats in sight," he said. Nigel Bell and his family from Newcastle watched what they described as the head of a large animal move through the loch at 6pm. The family, who were on the veranda of a holiday lodge at Foyers at the time, said that the head was larger than that of a cow and was about a third of the way across the loch. Regular visitors to the area, they were convinced what they saw was not the result of a boat wake or wave movement. Kelly Yeats and Neil McKenzie from Bridge of Deee, were staying at Foyers Bay House when they saw a "long necked, curved-headed" creature in the loch at 8.30am. The sighting lasted 10 minutes. A retired Master Mariner was cruising just south of Urquhart Bay in a Caley Cruisers' boat at a speed of nine knots when it was overtaken by an unknown object which came between them and the south shore. The sighting lasted several minutes and the object only disappeared as the boat moved towards it. A regular boat user on the loch, the captain said that there was no rational explanation for the object, which was unlike anything any of the boat's occupants had seen before. Robbie Girvan. owner of the Loch Ness Caravan Park at Invermoriston, took five pictures of what he described as a four foot high head and neck at 6pm when he was walking his dogs by the loch shore. He said he saw a long neck come out of the water and had time to return to the house, get his camera and return to take the pictures. Previously a non-believer, he said the "dark green and silvery" creature could only have been Nessie. Sidney Wilson, an English holiday maker from Nottingham, took a cruise down the loch to view the sights. As they approached Urquhart Castle two power boats appeared leaving a large wash in their wake. Sidney took two quick photographs of the boats and on the second one there appeared to be something in the water. After enlarging the image Sidney could see a head and a fin on the photograph. A two-minute video clip, recorded on this date, shows what appears to be a long, black creature swimming just below the surface of Loch Ness. Click here to view Gordon's video. The creature's head breaks the surface as it propels itself through the water. Images from the tape also clearly show how the creature creates a wake on the surface of the water as it swims in the direction of Inverness. The film was taken by amateur scientist Gordon Holmes, from Shipley, Yorkshire, who estimates the "creature" was moving at around 6mph. Mr Holmes, who works as a technician at Bradford University, was in the area using hydrophones to detect underwater noises from the loch. He said he saw the monster at 9.50pm while he was filming the loch from a layby on the A82. Mr Holmes, 55, said: "I was minutes from going home but I saw something moving and dashed out of the car and switched the camcorder on. "About 200 yards away from me I could see something in the water. It was definitely a creature propelling itself through the water. It was fairly bubbling along the water. It was streaking along." Foyers shop and cafe owner Jan Hargreaves and her husband Simon believe they caught a glimpse of "Nessie". It was while taking a break on the store's front decking, looking out to the loch, when Mrs Hargreaves and kitchen worker Graham Baine spotted an unusual figure cutting a strange shape on the loch. "We were standing looking out and saw something that looked bizarre," said Mrs Hargreaves. "I said to my husband to come and have a look. "We stand here all the time and look out and see boats and kayaks but it didn't look like anything we have seen here before." Despite the unidentified creature being quite a distance from their vantage point, Mrs Hargreaves said it had a long neck which was too long to be that of a seal and it was black in appearance. "It went under the water and disappeared for probably 30 to 40 seconds and then came back up again," said Mrs Hargreaves. "It was around for a good four to five minutes. It was just so strange." Keen to stress she is not seeking publicity, Mrs Hargreaves does firmly believe what she saw was the Loch Ness Monster. "It was so exciting," she said. Nessie hunter Steve Feltham said he heard about the possible sighting when he popped into the store and believes because it was from residents rather than tourists, it is more credible. "I'm excited by the fact it was locals who had seen it," said Mr Feltham. "It's quite a distance from the shop to the water and they watch everything that goes on there." What particularly excited Mr Feltham was that it was from the exact same vantage point where Tim Dinsdale shot the best footage of the legendary creature back in 1960. "I'll put the sighting with the other sightings," said Mr Feltham. "I will also continue to carry out surface observations." The sighting was recorded between 2.30pm and 3pm. Subject to various copyright © Legend of Nessie 1996 - 2009.